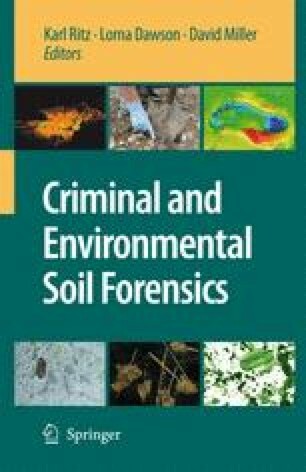 Ecology, botany, and palynology are now accepted as part of the armoury of forensic techniques. These disciplines have been tested in court and have provided evidence for contact of objects and places, location of clandestinely-disposed human remains and graves, estimating times of deposition of bodies, differentiating murder sites from deposition sites, and provenancing the origin of objects and materials. It is important that the forensic palynologist is a competent botanist and ecologist. Sadly, not all practitioners have this essential background and, therefore, produce work inadequate to withstand scrutiny in court. Palynology involves the identification of many classes of microscopic entities, the most important being pollen, plant spores, and fungal spores. The practitioner needs to be able to identify palynomorphs in damaged and decayed states and this requires experience and skill. However, identification is still the lowest level of palynological expertise, and interpretation of palynological assemblages requires knowledge of plant distribution, developmental responses, and phenology, as well as ecosystem structure and function. The forensic palynologist must also understand highly manipulated and artificial systems, and the complexities of taphonomic processes. There have been attempts to make forensic palynology ‘more scientific’ by the construction of test trials, the application of current statistical techniques, mathematical modelling, and reference to aerobiological data and pollen calendars. But these appear to be of limited use in the forensic context where outcomes are scrutinised in court. There is a high degree of heterogeneity and variability in palynological profiles, and every location is unique. It is impossible to achieve meaningful and forensically-useful databases of the palynological characteristics of places; predictive models will always be crude and unlikely to be of practical value. In spite of this, the experienced ecologist/palynologist has been able to identify places, demonstrate links between objects and places, estimate body deposition times, and differentiate pertinent from irrelevant places very successfully. Nevertheless, there has been no substitute for examination of every pertinent place, and every relevant exhibit in each criminal investigation.